Although the months of anticipation before a woman becomes a parent can be joyous and fulfilling, they can also mark a time filled with uncertainty and worry over potential birth defects, pregnancy complications, and chronic health conditions. These worries are not unfounded. Recent statistics show increases in preterm deliveries, low birth weight babies, and the incidence of cesarean sections among U.S. births. Fortunately, maternal and fetal monitoring, prenatal care, and healthy habits can reduce the risk of complications and make labor, delivery, and the postpartum period less stressful. 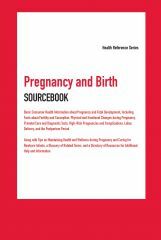 Pregnancy and Birth Sourcebook, Fourth Edition provides health information about the reproductive process—from preconception through the postpartum period. It provides information about fertility, infertility, and pregnancy prevention. The book’s chapters explain the physical and emotional changes that occur during pregnancy, and they discuss topics related to staying healthy during pregnancy, including eating nutritiously, exercising regularly, obtaining prenatal care, and avoiding harmful substances. Facts about high risk pregnancies—such as those in women with chronic medical conditions, advanced maternal age, or weight concerns—are included. Finally, the book answers common questions about labor and delivery, postpartum recovery, newborn screening, and infant care. A glossary of terms and a directory of resources for information and support are also provided. Part I: Preconception Health: Preparing for Pregnancy provides information about health habits, screenings, and interventions women may need prior to conception. This part also addresses factors that influence fertility (such as age and stress), details common causes of infertility, and identifies methods of preventing unintended pregnancies. Part II: Understanding Pregnancy-Related Changes and Fetal Development provides trimester-by-trimester details about physical changes in the fetus. The part also identifies early signs of pregnancy, suggests strategies for determining conception and due dates, and discusses emotional concerns and physical changes that may occur during pregnancy, including depression, back pain, pelvic floor and bladder problems, and vision and oral changes. Part III: Staying Healthy during Pregnancy highlights strategies women can undertake to help promote a healthy pregnancy. These include getting prenatal care and related medical tests, using medication safely, eating nutritiously, exercising, preventing excessive weight gain, and avoiding toxic substances and other harmful exposures. This part also offers advice on how pregnant women can stay safe at work or during travel. Part IV: High-Risk Pregnancies discusses pregnancies at high risk due to maternal age, multiple fetuses, or chronic health conditions, including allergies, asthma, cancer, diabetes, epilepsy, lupus, sickle cell disease, thyroid disease, eating disorders, and obesity. Part V: Pregnancy Complications describes diseases and disorders that may influence a pregnancy’s outcome, such as amniotic fluid abnormalities, birth defects, bleeding, blood clots, gestational diabetes, hypertension, severe nausea and vomiting, placental complications, Rh incompatibility, umbilical cord abnormalities, sexually transmitted diseases, and other infections. This part also offers information about preterm labor and pregnancy loss, including ectopic pregnancy, miscarriage, and stillbirth. Part VI: Labor and Delivery includes information about planning for labor and delivery by choosing a birthing center or hospital, selecting a birth partner or doula, and preparing a birth plan. This part also provides details on the stages of labor, pain relief during labor, vaginal and cesarean births, and emergency situations that may occur during childbirth. Part VII: Postpartum and Newborn Care discusses common postpartum concerns, including recovery expectations for new mothers, newborn care and screening tests, breastfeeding and formula-feeding tips, strategies for bonding with a new baby, and considerations for working after a child’s birth. Part VIII: Additional Help and Information includes a glossary of important terms and a directory of organizations that provide help, information, and assistance to low-income pregnant women and their partners.